Home Internet How to Deactivate Twitter Account? 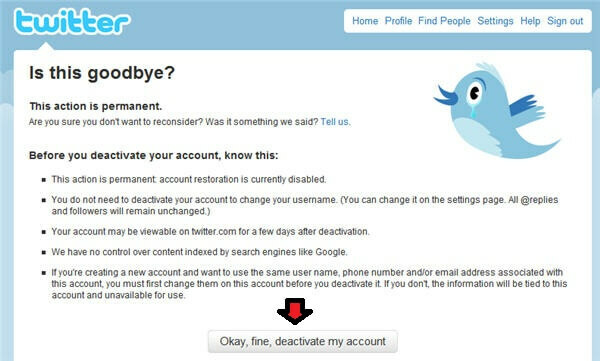 How to Deactivate Twitter Account? This post helps you in Deactivating your Twitter account. Deactivating a social media account is not the same as deleting it. If you plan on not using your account for a short period but wish to continue the use after the desired period, you can deactivate it. Deactivation of your account will let your friends and family know that you are not available on the particular social media handle for contact. In short, they will not be able to locate you on the social media website. Deactivation of social media accounts is also a good idea for people who want to impose self-discipline for their social media interaction addiction. Once you have gained a control over your addiction, you can simply log in to your account with the existing credentials. You will not lose your followers/friends on deactivation of the account, if you log in occasionally. Instead, you will get the access back to your account, the way it was before whenever you want it in a few clicks. 1. You cannot deactivate a Twitter account using the Twitter mobile application. 2. You need to either log in to Twitter via a browsing window on your laptop, desktop or smartphone. 3. Deactivating the Twitter account will not resolve issues like missing tweets, suspicious direct messages, incorrect follower or following status, etc. You need to resolve these issues using the troubleshooting articles on Twitter or by contacting the customer helpline. 4. Twitter officials will automatically delete your account in one week after the completion of 30 days post-deactivation. If you do not wish to lose your account permanently, you must log in at least once in the 30 days period to reactivate it. You may deactivate your account again to extend deactivation period to a fresh start of 30 days. 5. You also have the option to change your account name, email address, or other critical login details in the settings section on Twitter without deactivating your account. 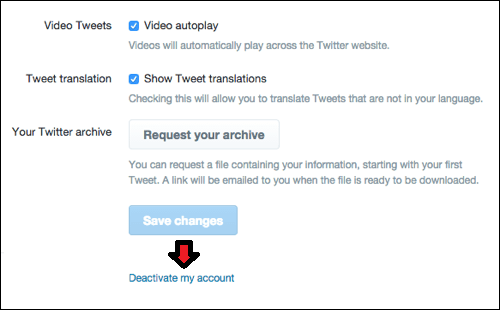 You can follow the steps given here, if you wish to deactivate theTwitter account. 2. Go to the Account settings available in the navigation menu. 3. Click on the link ‘Deactivate my account’ located at the bottom of the page. 5. You will now need to enter your Twitter login password again to verify the decision and your identity. What Happens After You Deactivate Twitter? Once you have deactivated your Twitter account, your tweets will vanish and no one can see them. This happens almost instantly, however, it might take up to a week before you are completely anonymous on the platform. delete a single tweet quickly using the options located beside the tweet. make your available only to your followers by enabling the private mode. To do so, you can choose the ‘Protect My Tweets’ option under ‘Privacy and Settings’ tab available in the ‘Profile and Settings’ menu. You can also block a particular follower in case you do not wish him/her to read your tweets while making it available for others. To make sure that your account is not deleted after your deactivated, it is critical that you log in once every 30 days. If you fail to do so, you can lose your Twitter account forever. This post really worked, Thank you. This post really helped me deactivating my Twitter account, thanks.